This gold glitter cat cake topper will be the perfect addition to your birthday party or photo shoot and is handmade by Christina Shannon, artist & mother of two twin boys, in Lansdale, PA. Cake Topper ears are 2.2 inches wide x 2.36 inches tall and the mouth is 2.15 wide x 1.35 tall. The picks are 3.5 inches long. 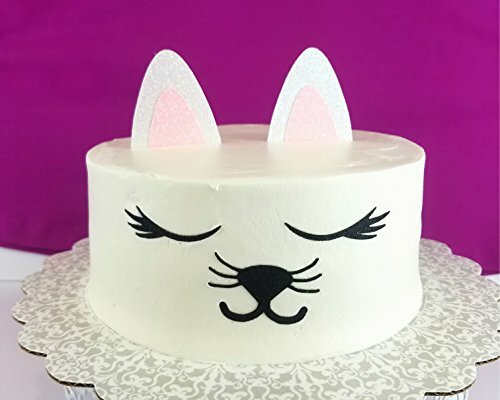 Ideal for an 8 to 10 inch cake to celebrate a kitty cat birthday! Top quality double sided glitter stock gives a heavy duty feel and prevents shedding, so glitter doesn't wind up on your cake. (beware of made in China toppers, which often use less expensive stock). Picks are mounted flush using clear adhesive and clear picks which makes your kitten birthday cake topper look seamless. (doesn't "bubble out" like mass produced cake toppers) Lettering is hand-crafted using a blade cut printing device to ensure quality, precision, and accuracy. Cake Topper ears are 2.2 inches wide x 2.36 inches tall and the mouth is 2.15 wide x 1.35 tall. The picks are 3.5 inches long. Ideal for an 8 to 10 inch cake to celebrate a little pumpkin 1st birthday! If you have any questions about this product by CMS Design Studio, contact us by completing and submitting the form below. If you are looking for a specif part number, please include it with your message. LOVENJOY with Gift Box Rhinestone 90 Cake Topper for 90th Birthday Party Supplies Gold, 5.7 X 4.5"
Despicable Me Beach Party DecoSet Cake Decoration.